I see there is a section under Emails & Notifications labeled Push Notification . I can’t seem to find the difference between the notifications in this section and the notifications and channels under the Voice Assistant. Great question. Push notifications are defined as an automated message sent by an application to a user when the application is not open. With push notifications enabled on Optimus News, you will receive a notification directly to your desktop whether or not you have Optimus News open. Furthermore, you technically do not even have to have an internet browser open to receive push notifications. As long as you have push notifcations enabled on both your internet browser and Optimus News, you will receive a notification no matter what you are doing on your computer. 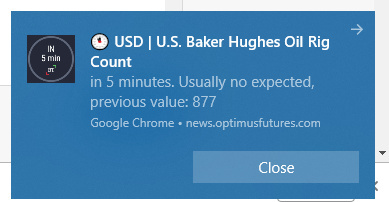 For example, I did not have Optimus News or an internet browser open 5 minutes before an event release, but I still received a push notification to my desktop as shown below. I hope this clears things up. Let me know if you have any other questions on Optimus News!